So growls the Grinch as he laments the oncoming onslaught of Christmas joy certain to echo up from the little town of Whoville. And for fifty-three years, we’ve put up with him. It was fifty-three years ago this year, in 1957, that the Grinch made his first appearance. And it was forty-four years ago this week that he first appeared on television. The result, How the Grinch Stole Christmas!, has become an enduring holiday favorite, and The Grinch has become as universally recognized as the crotchety, tight-fisted ol’ Ebenezer Scrooge when it comes to anti-holiday grouchiness. The Grinch, of course, thinks the holiday is about presents and food, so he steals them all to prevent Christmas from coming to Whoville. But just as he’s about to dump everything off the top of Mount Crumpit, he hears the residents of Whoville singing in celebration that Christmas has arrived—Grinch or not. 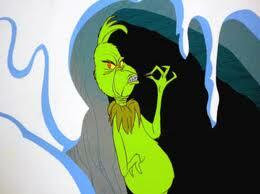 With his Grinch-feet ice-cold in the snow, he puzzles and puzzles—and then reaches an epiphany. The book turned out to be one of Dr. Seuss’s most popular. It has never gone out of print. In 1966, on December 18, CBS premiered the Grinch TV special. CBS had great, unexpected success the year earlier with A Charlie Brown Christmas Special, so the network was interested in a follow-up. By the time it was done, The Grinch was reportedly the most expensive half-hour program ever created for prime-time television up to that point. 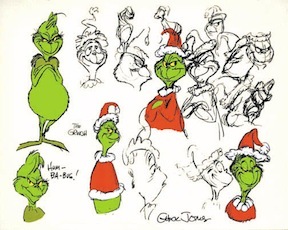 For the special, Dr. Seuss collaborated with acclaimed animator Chuck Jones to bring the Grinch to life. It was there that the Grinch took on his green hue for the first time. Jones also added songs composed by Albert Hague, who collaborated with Seuss on other projects like The Cat and the Hat Songbook. Geisel wrote the lyrics. The deep voice that sings “You’re a Mean One, Mr. Grinch” was provided by Thurl Ravenscroft—who also did the voice for Tony the Tiger in Frosted Flakes commercials. Ravenscroft was accidentally uncredited for his vocal work, an oversight Seuss didn’t catch until the studio showed him the final production. Seuss called Ravenscroft to personally apologize and wrote to newspaper editors across the country to clarify the error. To this day, though, people still mistakenly believe Karloff did the singing. The other speaking role—little Cindy Lou-Who’s plaintive, “Santy Claus, why? Why are you taking our Christmas tree? Why?”—was voiced by June Foray, best known for her work as the voice of Rocky the Squirrel and, from Looney Tunes, Witch Hazel and Tweety Bird’s owner, Granny. The Grinch later went on to appear in two other TV specials—winning Emmy and Peabody Awards—and of course he was brought to life on the silver screen by Jim Carrey, directed by Ron Howard. 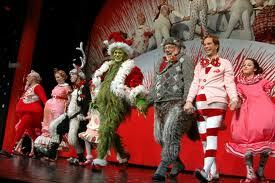 The Grinch even appeared in a limited-run Broadway show in 2008.
that Ted [Geisel] kept tight control over his creations, so he was directly involved with many of the changes to the Grinch, Max, and the Whos over the years. 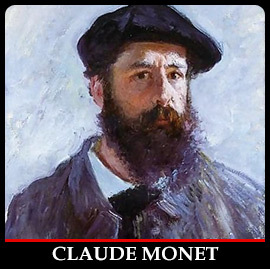 He obviously didn’t feel that his characters had to be completely static and immutable entities. Some of the innovations, like the greenness of the Grinch, were so successful that they have almost replaced Ted’s original vision. But there’s something gratifying to read the book to a classroom of elementary school students—as I did today—and, afterwards, see the kids nearly crawling out of their skins with eagerness to tell their own stories about the Grinch. Their hands shoot up, their words spill out, their smiles curl wide on their faces. 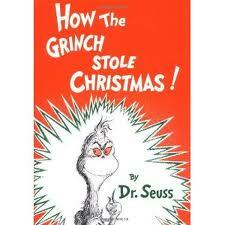 Seuss’s original book that will always charm and delight Grinch fans the most. For additional reading: Charles D. Cohen provides some insightful behind-the-scenes background and commentary in the 50th anniversary edition of How the Grinch Stole Christmas!. Dr. Seuss & Mr. Geisel, the biography by Judith and Neil Morgan, also offers a little bit of background, too.